Joseph Newell was a son of Rachel and William Newell. He was born on 7th July 1894 in Stewartstown. He was on of twelve children. The family lived at North Street, Stewartstown. His father was a general labourer. Joseph joined the army at young age. From 1912 he was an officer’s servant. His master, with whom he was very popular, was medically unfit for active service. Private Joseph Newell elected to go to the front. 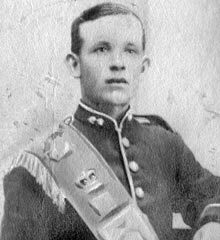 He was serving with the 2nd Battalion of the Royal Inniskilling Fusiliers when he was killed in action on Wednesday 21st October 1914.